Nearly one in five Americans, or over 60 million people, suffer from allergic rhinitis. But what is it? And why is it so important to understand? Well, as the name implies, allergic rhinitis is a allergic reaction in the nasal passages and eyes. One of the easiest ways to be exposed to an allergen is to inhale it through the nose or mouth, which is what makes this reaction so common. When allergic rhinitis is specifically caused by plant pollens that are floating in the air and inhaled, it is commonly referred to as hay fever, or simply seasonal allergies. Both of these are slight misnomers, as it is not always caused by an allergy to hay or grass, nor does it necessarily cause a fever. Depending on the source, allergic rhinitis can persist year long, and can lead to other problems such as sinusitis or ear infections. Allergic rhinitis can be caused by multiple sources of allergen: pollen, mold, animal dander, and dust are common culprits. Specific plant sources are pollen producing trees, grasses, and weeds. These particles are carried through the air, thus hot, dry, windy days have more airborne pollen and a higher likelihood of inducing allergic rhinitis in sufferers. It can be seasonal and linked to blooming plants, or perennial and caused by indoor allergens, such as dust mites, pet hair or dander, cockroaches, or mold. Environmental irritants such as cigarette smoke, strong perfume or cologne, and diesel exhaust can also be triggers for some sufferers. The symptoms of allergic rhinitis are very uncomfortable and inconvenient for the sufferer. These can include repetitive sneezing, which persists throughout the day; or a runny nose, often with an accompanying postnasal drip that can cause an itchy throat. The nose can also be stuffy due to blockage or congestion, this can also cause a decreased sense of smell and clogged ears. Watery, itchy eyes, mouth, and skin are common signs of irritation. Fatigue is a common symptom, which is often caused by an inability to sleep caused by nasal obstruction. Wash hands after contact with animals, and if you own a pet, have a nonallergic person help with grooming in a well ventilated area or outside. Due to the hot, windy, and dry climate in Southern Arizona, allergic rhinitis Tucson symptoms can persist year round, without respite. Sufferers should seek professional attention to combat the harsh conditions that increase airborne allergens. Do these symptoms sound familiar? Are you spending your days sniffing and blowing your nose, rubbing your eyes to no relief, and losing sleep from your congestion? Allergic rhinitis could be to blame. Find out what is causing your symptoms and get relief now! 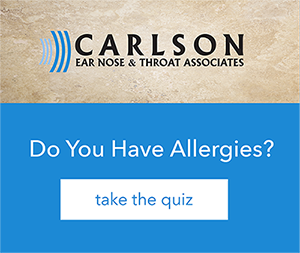 Make an appointment to see a certified Ear, Nose, and Throat Allergist at Carlson ENT today!